Summer is a time for fun, so don’t waste it stressing about snacks! 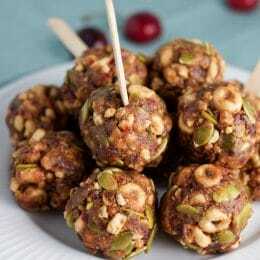 Fruity Nut n’ Honey Energy Bites are a portable, make-ahead snack you can feel good about giving your family. 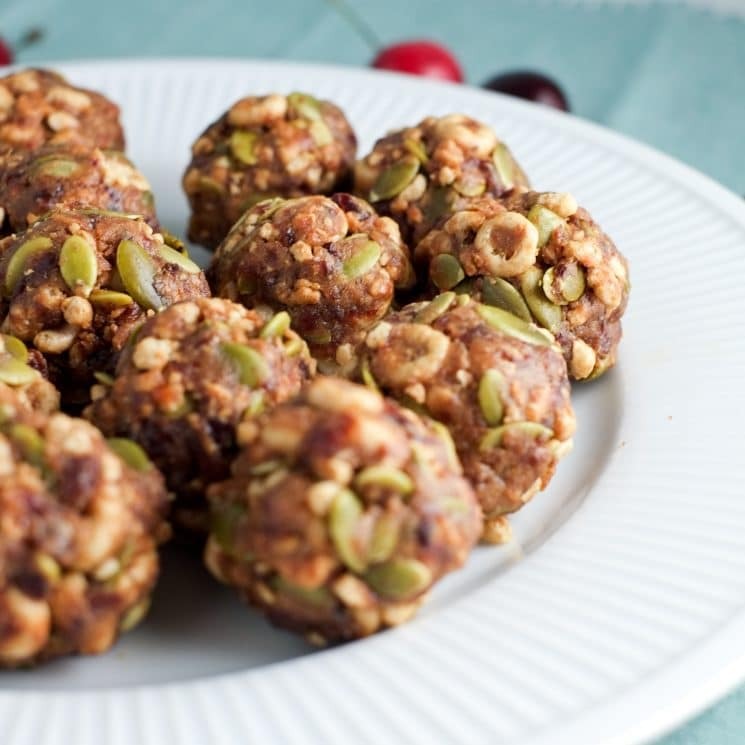 These nutrient dense energy bites are full of fruit, nut butter, seeds, and whole grains! Summer is officially here! With all this “free time,” life seems busier than ever! Potlucks, camps, road trips, lake outings… the list goes on and on. With all these activities, kids get hungry and parents feel overwhelmed. In the midst of all this activity, how do you help your kids eat nutritious snacks that actually fill them up? 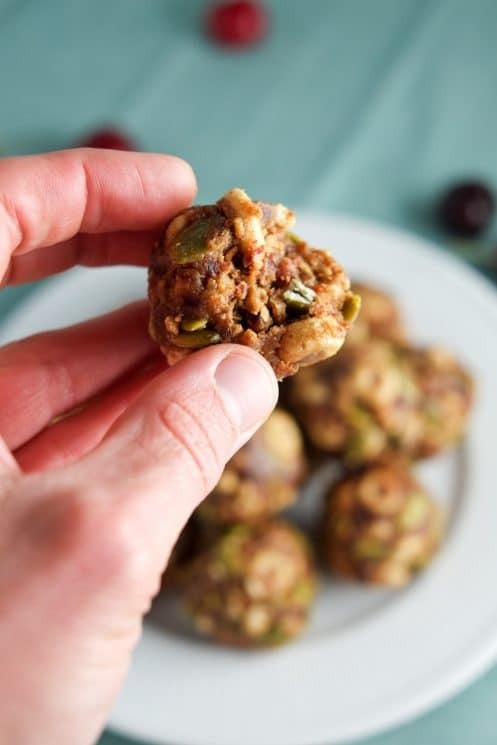 Energy bites are a great snack to help with crazy summer schedules! They’re quick and easy to make, and a big batch will last all week. 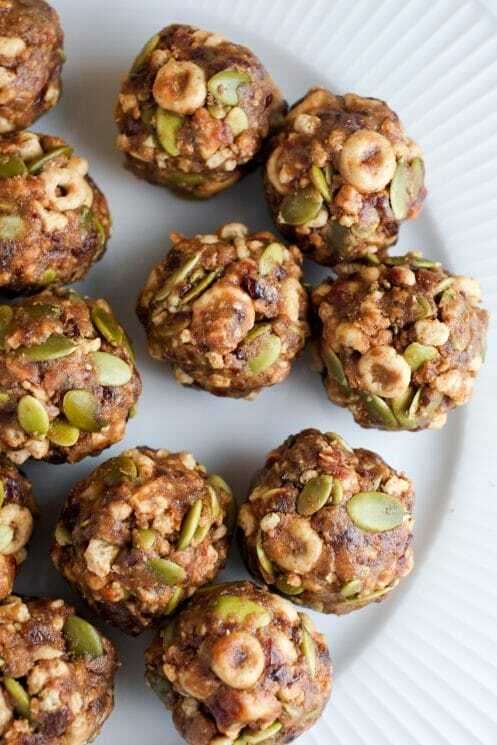 These energy bites are super filling because they’re packed with protein and fiber. Fiber helps you feel full, and protein helps keep you full longer. That’s just what you need for those long, high-energy summer days! We already love whole grain cereal as a simple, wholesome breakfast that our kids can “make themselves” on busy days. It’s also often a lifesaver snack during summer! General Mills Cereals provide great summer feeding solutions. 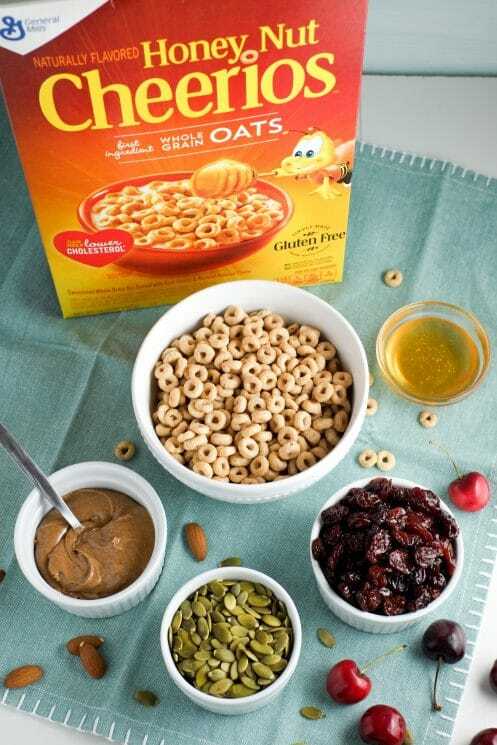 We love Honey Nut Cheerios because they’re made with whole grains – the first ingredient is whole grain oats! Plus, they’re made with real honey, so their subtle sweetness is delicious and wholesome. 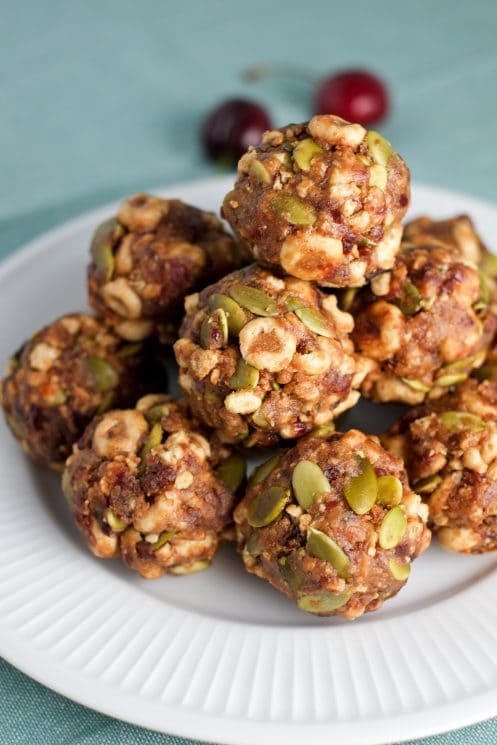 We used Honey Nut Cheerios in these energy bites because we know many families often have them on hand. This makes it easier to whip these up whenever you need to! Plus, they add a nice sweetness and crunch that is just delicious. There are so many creative ways to use General Mills Cereals to make great summer snacks for your family. Try breakfast bars and snack mix, just to name a few! Since we’re using dried fruit in these energy bites, we need to soften them a bit before we can use them. Press 1 cup of dried cherries into a tall, thin drinking glass. Pour hot water into the glass until it just covers them. Allow these to sit for 10 minutes to soften and plump. Note: If desired, you can substitute raisins or craisins, but we love the sweet tangy flavor of dried cherries for this recipe! Once the cherries have softened for ten minutes, drain the excess water off and add the cherries to a food processor. Add one teaspoon of vanilla. Pulse the mixture until the cherries are well blended. If you have any difficulty blending, add just a bit of water. Add the other 1.5 cups of Honey Nut Cheerios to the food processor and pulse again, until the Cheerios are mostly blended. Add the cherry mixture to the mixing bowl and stir everything together. Use your hands to form small balls, pressing the mixture tightly together. If you find the mixture too dry to stick together, feel free to add another dollop of almond butter. Just make sure not to add so much that the energy bites become sticky and gooey. 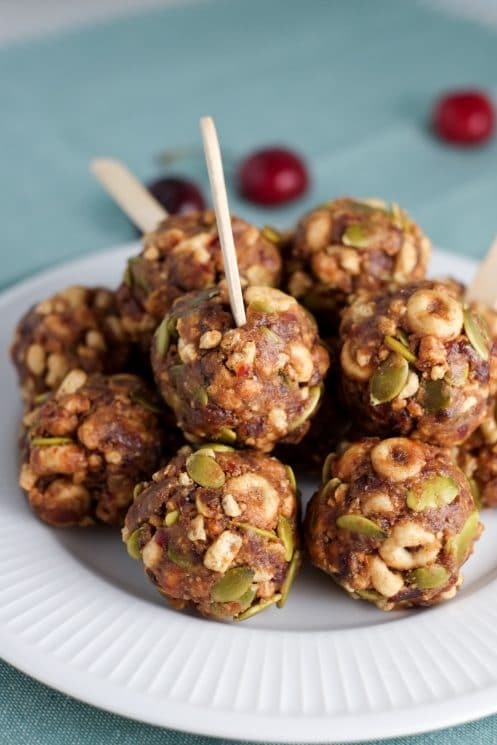 TIP: To make these energy bites even more convenient on the go, insert popsicle sticks into the centers just after forming them. This prevents sticky fingers! If you’re not going to eat all the energy bites right away, you’ll need to store them in the fridge. This keeps them fresh and helps them firm up. 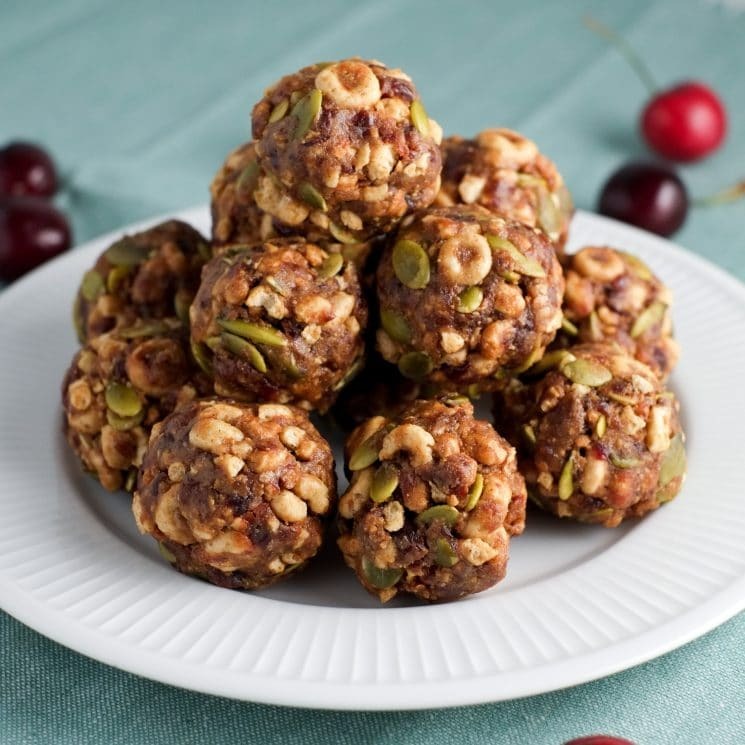 To store in the fridge, place the energy bites in an airtight container or seal-able bag. Keep them in the fridge for up to a week. One more tip: put some in snack-size baggies so you can grab them on your way out the door. Whole grain cereal is a great solution when summer gets hot and time is short. 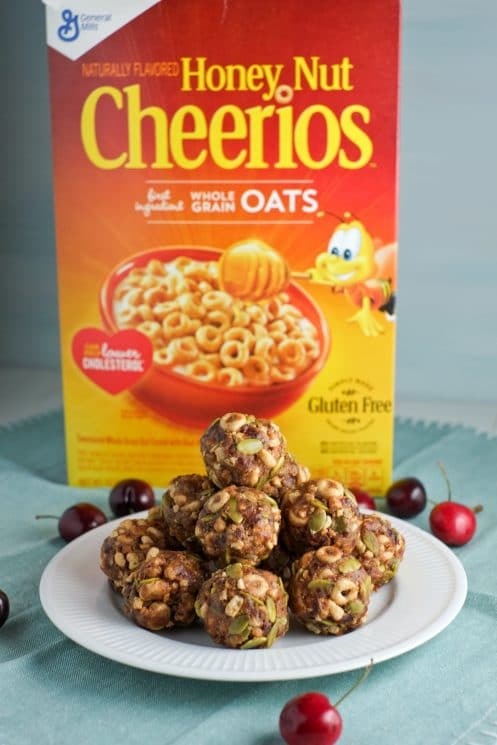 Kids are sure to love these Honey Nut Cheerios inspired energy bites! Add 1.5 cups of the Honey Nut Cheerios to the food processor and pulse again until the Cheerios are fairly crushed and well mixed in. 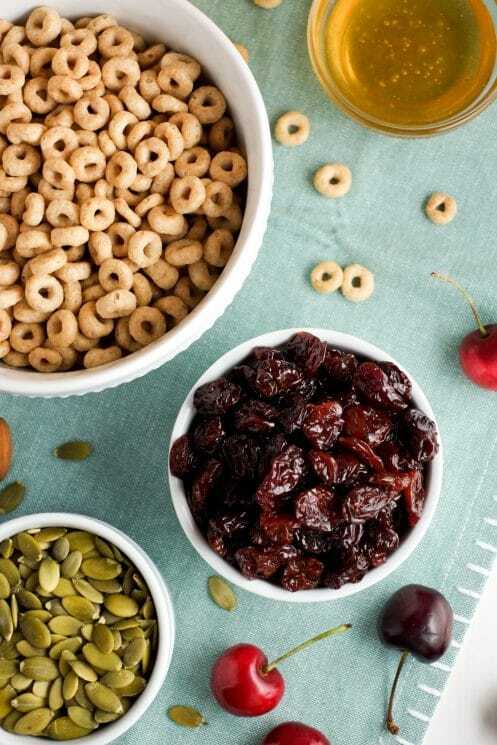 In a medium bowl, combine cherry mixture, pepitas (pumpkin seeds), almond butter, honey, and the remaining 1/2 cup of whole Cheerios. Mix well.